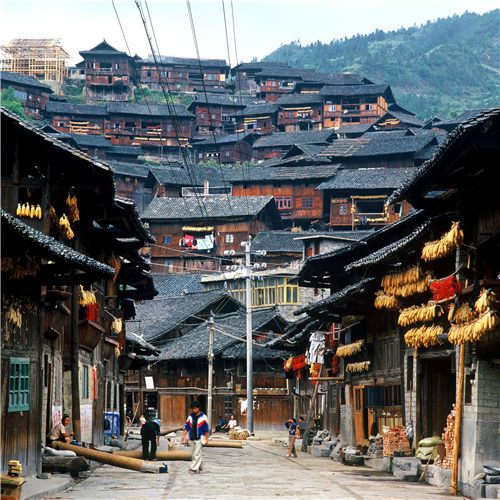 Traditional dwellings dominate a village of the Miao ethnic group in Leishan county, Guizhou province. Father's devotion to capturing good photos saw him invest savings in craft. Photographer Zhan Rencai is preparing to take his 5-year-old daughter to visit the She ethnic group in the provinces of Jiangsu and Zhejiang in April. He hopes she will eventually be able to see all the country's ethnic groups, matching his own achievement in the first decade of this century. "With the rapid development of society, some formerly isolated ethnic group settlements have had opportunities to communicate with the outside world," the 57-year-old, from Mudanjiang, in northeastern China's Heilongjiang province, said. "It is a good chance for them to learn more about modern civilization, but it can also be a challenge for them to preserve original ethnic characteristics. "I want to understand their daily lives in various ethnic dwellings through my photographs." 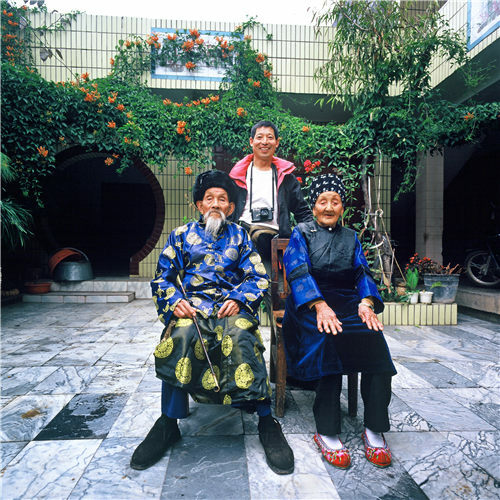 From 2003 to 2009, Zhan traveled around the country, taking more than 40,000 photographs of ethnic groups' daily lives. In April last year, he decided to donate all his precious negatives to the Museum of Ethnic Cultures at Minzu University of China, in Beijing. After five years of service in the military, Zhan began working in the publicity department of the railway bureau in Mudanjiang in 1990, devoting himself to photography. During the decade of rapid development in the 1990s, Zhan took a series of photographs recording the great changes in the railway system and outstanding railway staff. To improve the quality of his photography, Zhan spent 120,000 yuan buying a camera set in 1998. "That was almost all my savings, with which I had originally planned to buy a new apartment," he said. "At that time, the money could have bought a 200-square-meter apartment in Mudanjiang." Zhan with a couple from the Bai ethnic group in Dali, Yunnan province, in 2004. In 2003, he was tasked with taking a set of photographs featuring China's railways to welcome the Beijing Olympic Games in 2008. During that project, Zhan came up with the idea of simultaneously photographing ethnic groups. With the privilege of free train travel as a railway employee, Zhan traveled more than 300,000 kilometers in a seven-year period for the project. He recorded his entire journey in 1.2 million words in 22 photographic diaries. "Before I started, I spent eight months looking up information, including the distribution, locations, cultural and local customs, and historical changes of ethnic groups," he said. "Therefore, I focused my photography on ethnic dwellings that can represent their customs, migration and integration well. "From the dwellings, we can find evidence of caves, tents, houses and other forms during the process of human development. They can even tell the historical changes of a nation, as well as the balance between man and nature." During the project, he visited more than 500 ethnic villages in 50 regions. "Even in the same ethnic group, residents in different regions have different characteristics in dwellings and lifestyles," he said. "For example, in the pastures of the Tibet autonomous region, Tibetan residents usually choose to live in tents, while in the farming areas, residents choose dwellings made of earth, stones and wood."